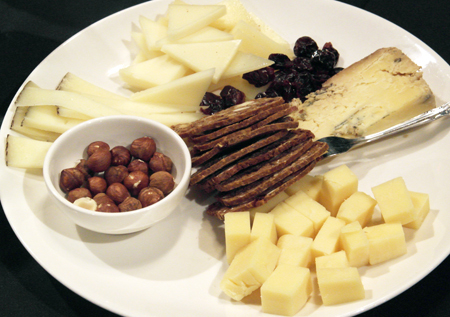 Traditional port accompaniments: cheese, nuts, dried fruit. 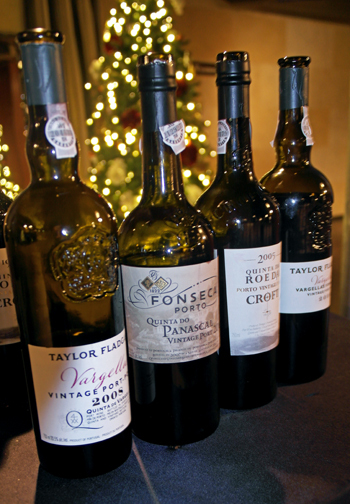 "Port is a long lived wine enjoyed at at different stages and different times.Vintage port is the pinnacle of the industry," declared Adrian Bridge, CEO of Taylor Fladgate which produces Croft, Fonseca, and Taylor Fladgate Ports. Bridge who was in Calgary for one day conducted a tasting of the best value vintage ports at Willow Park Wines and Spirits. "Vintage port is driven by quality. After harvest we taste through the previous year, those with the potential for vintage are put in vats. 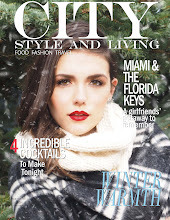 After another winter we make a blend and if we determine it is long lived then we make it a vintage." Such considered scrutiny is the backbone of vintage port where declarations are made only a few times in a decade. The Medieval city of Porto (Oporto) on the Atlantic coast of Western Portugal with the Duoro river winding through its centre is where ports were aged. The steep, remote hillsides of the Douro valley is where the grapes are grown. Previously the wine was transported along the river from the valley to the city but the building of dams put an end to this practise. Schistous soil like slate, sedimentary rock. The vines can push through the cracks in the rock. They do not irrigate as the water table is low. "The harder the vine struggles the better the quality of fruit." Touriga Francesa, Tinta Barroca, Tinta Amarela, Tinta Cão, Tinta Roriz (Tempranillo), and Touriga Nacional. A blend produces the best result as each grape brings something to the party. 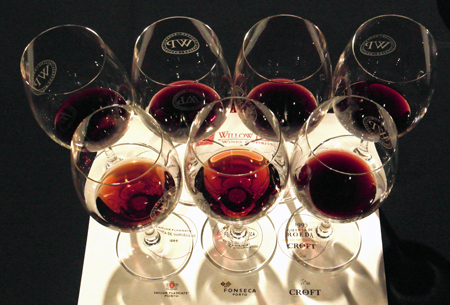 The tasting comprised seven vintage ports each with their own house style. Croft, Bridge described as "purity of fruit", Fonseca as "bigger, rounder, voluptuous, Rubenesque" and Taylor Fladgate as "elegant". Taylor Fladgate Quinta de Vargellas Vintage 1986: "It was lost colour in the bottle. Leather, spice on the nose. In the mouth maturity and complexity. There is a delicacy about it, in the mid-palate lusciousness. Raspberry, chocolate, licorice at the back." Fonseca Porto Quinta do Panascal Vintage 1986: "This has a different finish to Taylor Fladgate, white pepper on the finish." Croft Quinta da Roeda 1995 Vintage Port: "Darker, younger berry driver fruit. On the mouth richer fruit dark chocolate." Taylor Fladgate Quinta de Vargellas Vintage 2008: "Silky tannins, structure, younger. Enjoyable now and will go on to age - will lose colour and berry flavours will soften." 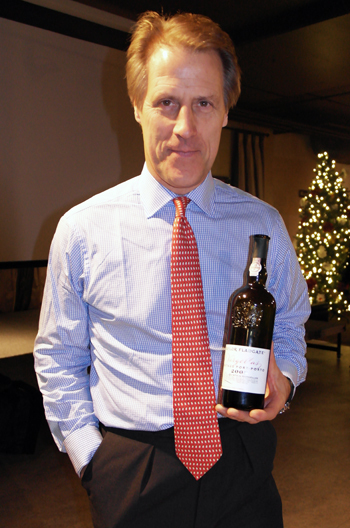 Fonseca Porto Quinta do Panascal Vintage Port 2005: "This is a pre-teen all youth and exuberance. 2005 is a good year fine harvest." Croft Quinta da Roeda Vintage 2005 Port: "Cassis, black currant. Could put it on ice cream. I would only open a bottle of vintage port when I can finish the whole bottle." Taylor Fladgate Vargellas Vinha Velha Vintage 2009 Port: "To my mind, best we've made incredibly powerful, incredibly concentrated. This is one of only three hundred cases made. This is the concentrated essence of Vargellas. It is a good investment.